SAN DIEGO — The defending champions Seattle Mixtape are finding their stride…and not a moment too soon. While Washington DC Space Heater captured the headlines, Boston Snake Country is a first-year team with its own stable of all-stars from both single gender and mixed divisions. Snake Country made plenty of waves of their own, and Mixtape will need to be at the top of their game to survive this matchup and return to the final. This will be the first meeting between these two teams, highlighting the stark tiering of the Mixed Division this year, but expect a tight, physical matchup from the first pull. Mixtape had an up-and-down season this year, with a disappointing (for them) fifth place finish at WUCC and the US Open Club Championships, and a second-place finish at Pro Championships before pulling it together to win Northwest Regionals. You could never tell which iteration of Mixtape would show up on a given day. It could be the version that couldn’t find any consistency against Space Heater in pool play on Thursday, or it could be the version that closed their prequarters matchup with three straight breaks and fought back from a three point deficit to start against Blackbird. Snake Country had a season of deep runs in mid-level tournaments. They finished second at the Boston Invite and the Northwest Fruit Bowl, and won the Chesapeake Open in August, but they rarely saw top competition outside their region. That didn’t matter in the end, though. Snake Country powered through the East New England section before winning Northeast Regionals. An undefeated Thursday and Friday at Nationals, including a pool play win over Seattle BFG, solidified the team’s contender status, and an impressive eight-point run to cap a comeback against Mischief put them in the elite tier. Can Snake Country get it done against a true powerhouse, though? With a long club season and somewhat disappointing results, many wondered if Mixtape was starting to slip a bit after their championship season in 2017. While Thursday’s results added fuel to the fire, fanned by their surprise loss to Space Heater in the final round of pool play, Friday’s games put that theory to bed. Mixtape showed what they were capable of, fighting back from early deficits against Bay Area powers Polar Bears and Blackbird to prove the champs were here to stay. 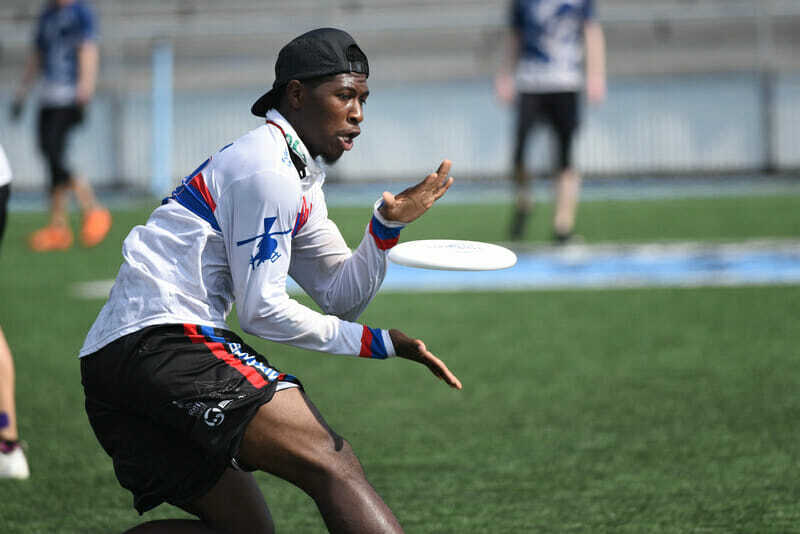 Khalif El-Salaam has ramped up his play from his already lofty standards, leading the team in goals while expanding his defensive prowess to handler defense, alongside his strengths of shutting down deep cutters and eating up errant hucks. Newcomers Emily Smith-Wilson and Reed Hendrickson are block-creating machines, locking down opposing cutters and looking to provide help on any throw in their area, and Paige Kercher is still a rock in the backfield, allowing Mark Burton to be aggressive with his throws. Mixtape’s matchup against a strong, physical Blackbird team should be the kind of preparation they needed to get ready for a tough Snake Country matchup. Watching El-Salaam and Klein shadow Mac Taylor and limit his downfield effectiveness should provide the blueprint for slowing down Peter Prial, and Mixtape’s athleticism should give them an edge on a top-heavy Snake Country team. Swarming defense, challenging every cut, and pushing the pace on a turnover are hallmarks of Mixtape’s game. With speedy deep threats like Claire Revere, Abbie Abramovich, and Brian Stout all available to pull in big hucks, Mixtape has the inside track for another final appearance. For a first-year team, Snake Country has a long history together. Started by several former Middlebury College alums, this is their first foray into the mixed division as a unit, but with several Boston Slow White veterans making the switch, as well as many former Ironside men, this team has the chemistry most first-year teams lack. On offense, everything starts with Prial and Brian Garcia. Prial is tied for the team lead in goals and assists so far, and he remains one of the top cutters in ultimate, regardless of division. Whenever BFG looked like they were gaining the upper hand in their pool play game, it was Prial who stepped up and broke open the defense to get Snake Country back on the right foot. Garcia still has every throw in the book, and his presence in the handler set gives cutters like Prial, Lexi Zalk, and Piers MacNaughton the freedom to push the pace downfield and challenge defenses with their speed. Davis Whitehead gives Snake Country a true attacking threat on defense, too. Working with Jamie Quella, the Snake Country D-line offense can punish tired O-lines quickly and decisively. Whitehead’s four goals against Mischief keyed the comeback, and he’ll be instrumental in keeping pace with Mixtape. Snake Country proved this weekend that they have a shot at the title, and what better way to cement their bonafides than to knock off the defending mixed champions? Mixtape comes into the semifinals as the clear favorite on this side of the bracket, but after a big win over the defending WUCC champions in pool play, Snake Country must be confident in their ability to go toe to toe with the best in the division and come out on top. The one game per day format for semifinals and the final favors teams with a strong top 14, and Snake Country’s relative lack of depth won’t be as much of an issue. If they can keep Prial fresh and able to cycle in for big points on offense and defense, they have a shot. Mixtape has athleticism to burn, though, and can rotate El-Salaam, Klein, and Hendrickson onto Prial to slow down his cutting. Whoever is left will take on Garcia, who can be frustrated by quick, athletic defenders who won’t give up on high swing passes. Despite Snake Country’s chemistry and history playing together, Mixtape has been together at Nationals for years, and they should have the team strategy and talent to win out in the end. Comments on "Defending Champ Mixtape To Face Off Against Upstart Snake Country"